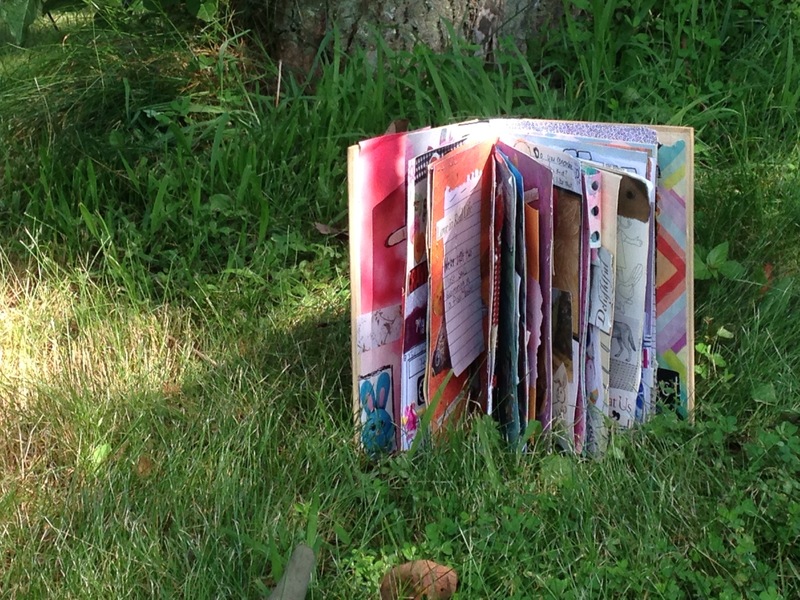 Have you ever wanted to learn how to alter a book to turn it into an art journal? 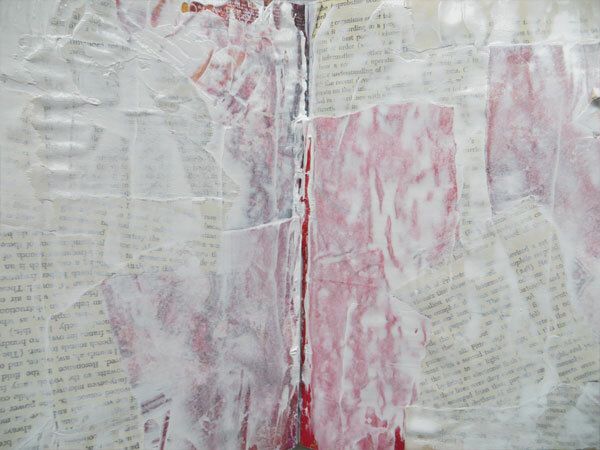 This post will share with you the basic steps for how to prepare an old book for art journaling. It is very important before altering a book or using an old book for art journaling is properly preparing it before you start creating in it. While it takes some time and patience to do this, in the end it will definitely save you a lot of headaches and ensure your creative work stays intact. In this post I will walk you through step by step my process of creating an art journal from an old book. 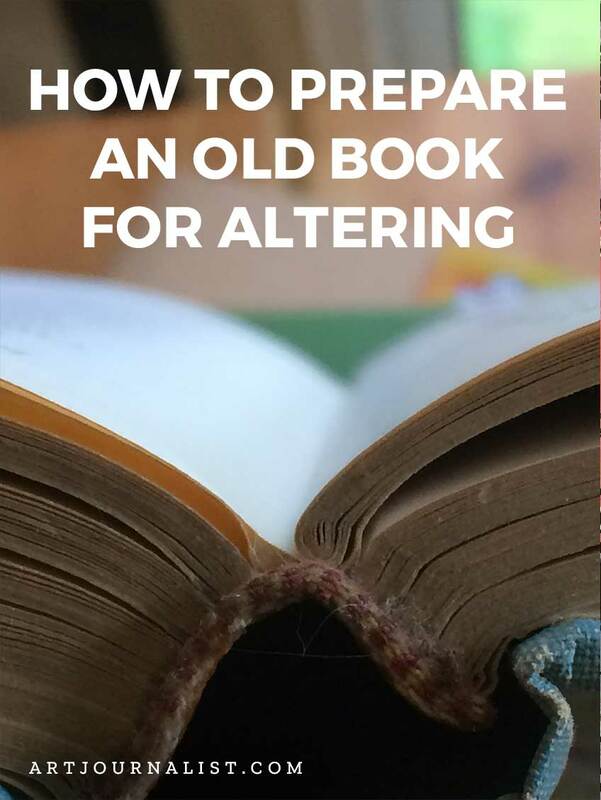 Choosing the right type of old book to alter is the first important step to take. While one would think that any old book would do, you’re going to want to look for one that has sewn binding as opposed to glued binding. While very old, vintage books like the ones shown here might be beautiful, these types of books are not always the best candidates to use for altering, at least not using the same technique the way I share here. Very old antique books will likely need a little reinforcement and more advanced book binding techniques in order to be something that is sturdy. Most books will either have sewn binding or glued binding. 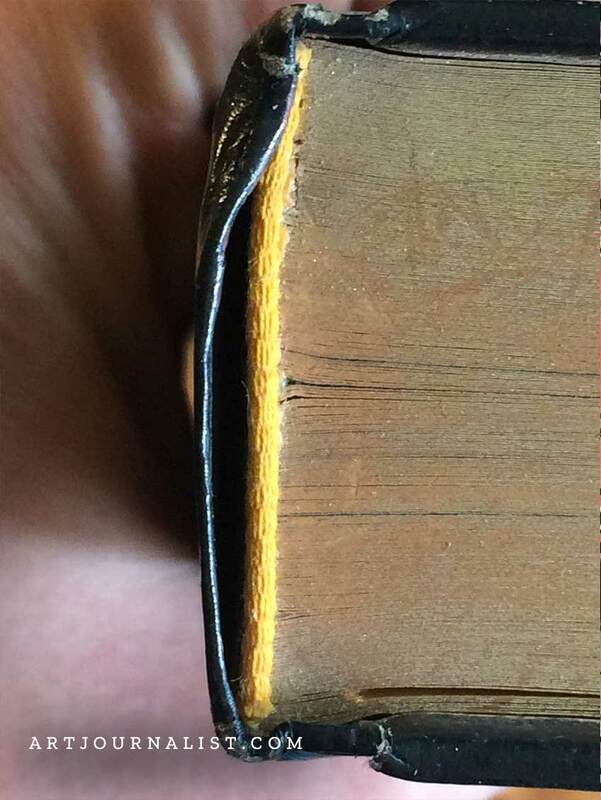 Glued binding is exactly what it sounds like – the pages are glued together. This is pretty common for most mass-market books printed in the past 30 years, even if they are a hardcover book. However, you do not want glued binding for your altered book projects if you can avoid it! Sewn binding is stronger and the pages will be less likely to fall out, whereas with glued binding you risk the glue coming apart and pages falling out. 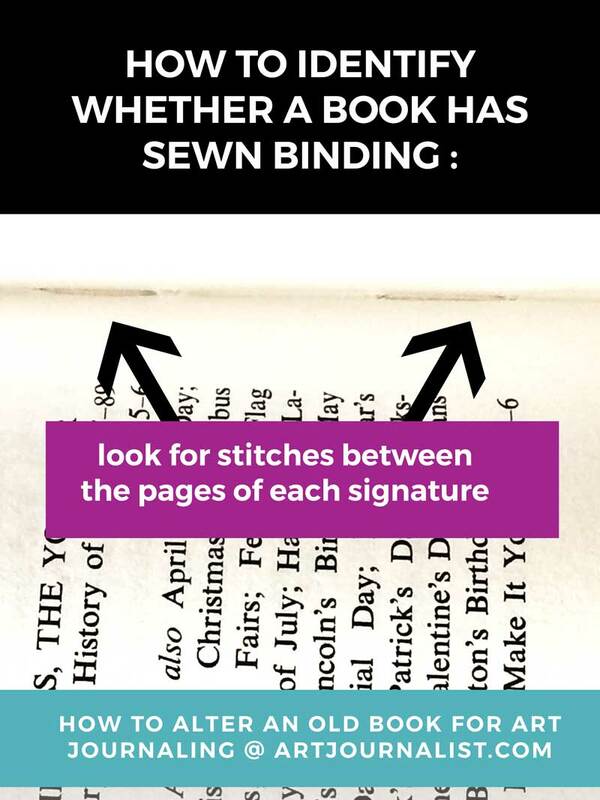 It is relatively easy to identify sewn binding in an old book you want to alter – you will see actual stitches in between the signatures of the book! What is a signature? Signatures are sections of pages, so you might see the stitches in between every 20-40 pages or so for example, depending on the book of course! Note: Some books this does not apply to – such as children’s board books. Need Some Inspiration For What Types of Books to Use? As you can see, there all sorts of different types of books to use for you to learn how to alter a book for art journaling! The possibilities are endless! Also think about the size of the book – do you want a big fat book with many pages or maybe a big skinny children’s book with plenty of room on each page as your canvas? Want to see how I shop for books and the types of books I like to get? Read This: How I Find Mixed Media Art Supplies At Used Book Sales. Once you have your books, you’re ready to start preparing it for altering and making into an art journal! Something I’ve learned with experience if you will be using the book for an art journal is that you may want to do is rip out at least half of the pages in the book. This may sound scary, but it will give you a LOT more room and flexibility later on in the project! So, if you have a 30 page book, you will turn it into a 15 page one. Why on earth would we do this? The main reason for this is because when you start painting on your pages, and glue stuff to them, it makes the book much thicker than the binding can handle. So, get ripping away! Of course, you do not actually have to “rip” the pages out – you can always use a craft knife and carefully cut these pages out. That sometimes looks a lot neater and nicer. I usually save my ripped out pages for gluing and collaging later on in the art journal, so these pages don’t even get wasted. Any leftovers are simply used for making junk journals! You may have different preferences and experiences than I have had with this – a lot will also depend on your style of creating art journal pages. I am very heavy on the collage layers, so for me it makes sense. Feel free to experiment with what works best for you and your style – The important thing is that the book’s binding will be able to hold up to the thickness of the book. Depending on the paper weight of the pages in your book, you will probably want to glue some of the pages together to make for a stronger and heavier page. I typically will use a heavy duty glue stick for this step when I make an altered book. Be sure to put a little extra on the corners as that is where they are most likely to come apart at. 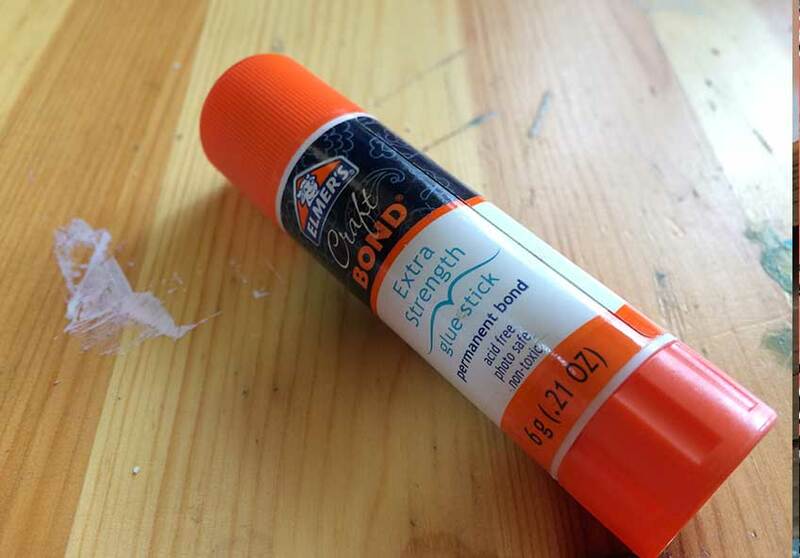 You can glue 1-2 pages together or several, depending on the weight of the paper in the book. Gluing your pages together will likely cause some rippling and bumpiness in the page, but no one said art journaling had to be perfect. If the bumpiness and wrinkling bothers you, you can also choose to use more collage elements and avoid the paint and wet media all together if the pages are thin. This step is completely optional, but is usually a “must-do” for me, as I love working with Gesso – it really does help the acrylic paint stick a bit better to the page. The main reason I use gesso however is because I usually choose some odd books for turning into journals and don’t usually want all the words and titles and page numbers showing through! This is from our altered composition book tutorial – you can see the Gesso does a very good job of covering things up – sometimes too good of a job! Not sure what Gesso is? Gesso is a white primer available at most craft and hobby stores. You can also find it online or if in a real pinch, go down to the local hardware store and buy a small pint of white primer – while not quite the same that will work too! Now You’re Ready to Create in Your Altered Book! Once the pages are ripped out, glued together, and the gesso has dried, you are ready to start creating in your new altered book! 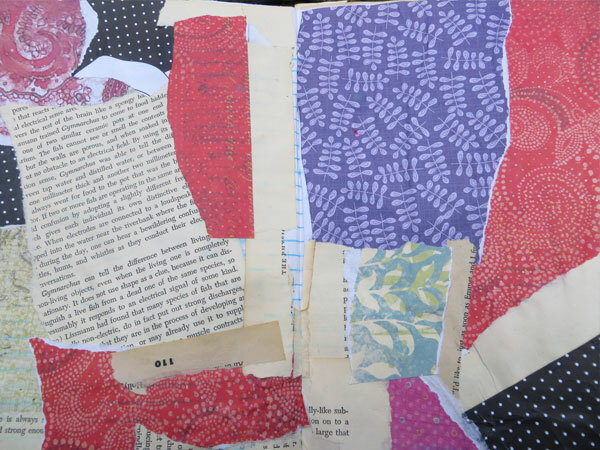 This is the really fun part of using an old book as an art journal! I hope you find this tutorial on how to create an altered book helpful, and of course, if you have any questions about how to start an art journal, share your questions in the comments section below or join us in our Facebook Community Group to connect with others! Love the idea of using an old book. I don’t care to keep my feet on the ground all the time.I like to step outside the box and explore. I am trying to develop new ideas to help widows find joy on their new path in life. The old is my life prior to my husband’s death. Now I will take that (book) life and find new meanings, purposes,creativity inside and build something beautiful by the grace of God. Oh thanks so much for the inspiration! I’ve traveled your journey and found many wonderful and memorable places. Take care. I’m so sorry to hear about your loss!!! Praying that you will be comforted as you give comfort to others. I think this will be a wonderfully crative thing for you to do and am sure you will be greatly blessed by it. No need to glue pages back in. Only take out those that you want to take out. I would try to find some acid free pens and pencils to write in your alter book. I realize that many of your other materials are not acid free, but you have better work ability with better I would try to find some acid free pens and pencils to write in your alter book. I realize that many of your other materials are not acid free, but you have better work ability with better pens and pencils. Have fun! I find when I put gesso down on a page, it’s hard to draw/paint on – things don’t leave their ink on the pages, do you know what I mean? Like it’s waterproof. Is this just me? Gesso changes how everything looks. Try using pencil and then smear it…. very cool. Gesso really is for using on any surface to make it “paintable”, but you can use chalks on it too. Pens and markers wont work as well. Or at least they will be greatly altered, which may actually be what you want. How do you keep the gesso pages from sticking together once they are dry. I let each page dry for 24 hours but still had problems with pages sticking together when the book closes–at least those pages that have not yet received their journal entry. You can help the sticking by rubbing the page (when you are finished with it!) with Dorland’s Wax Medium. It is a non-yellowing wax and resin mixture that strengthens oil paint film against shrinkage and cracking while sealing out dirt and air. I just use my fingers, or a soft thin cloth, to spread a tiny little bit all over the page. Works like a wonder. You can find it in small cans in an art store or online, of course. I don’t know if 2nd and Charles is a nationwide store or not,but they have free books outside and I’ve been able to collect a bunch of them for my projects Thanks for your good advice. All of these are great tips for prepping for some serious art journeling! Gesso is amazing for crafting purposes so I’m right there with ya! Thanks for sharing this post! It has my creative juices flowing!! I’ve always wanted to make one and I never knew where to start, so thank you for this post. I wish you included some pictures so we could see how it looks! Regardless, it was a good read with some great tips (like tearing half the pages away). I purchased some antique bird books to alter for scrapping, etc. what’s the best way to affix cloth to pages? I don’t have a sewing machine. I really want to complete these for my sisters and I as a way to remember our precious mother who loved birds and flowers and was the quintessential HOMEmaker.???? This is wonderful information. I have so many ideas and plenty of creative talent– but where, folks, do you find the TIME? I want so much to get started! ???? Thank you for the useful tips. Please remind people that some old books, especially those including local historical information or info on local people, are extremely useful to genealogists, so if you are buying old books, be careful not to destroy someone’s genealogical find. I have some parchment paper on hand that might be glued on to cover the pages and make a cool background for art. What kind of glue would you recommend so pages would be a little bit flexible, or isn’t it important to have flex? YES paste is a good paper glue. You can also find great books to use at the dollar store! !